The brand new Botley The Coding Robot 77-piece Activity Set from Learning Resources is approved by the prestigious STEM.org as a toy that meets its stringent criteria for qualifying as a STEM product. Botley has won multiple awards from leading parent, teacher and educator groups. Botley is used by teachers from leading schools around the world in their classrooms to introduce pupils to basic coding and programming concepts. Botley doesn't require a tablet or smartphone- you can learn how to program Botley without any screens and use Botley right out of the box! Children as young as 5 will enjoy instructing Botley on how to avoid and go around obstacles, follow routes, take on challenging obstacle courses, follow looping commands and even unlock special hidden features! These are the fundamentals of learning how to code. 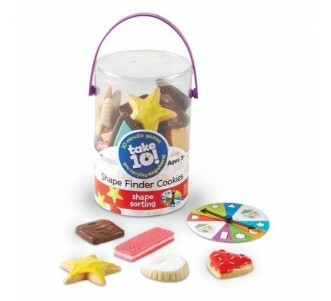 Older children will relish the more difficult challenges and enjoy programming more complex sequences and instructions. 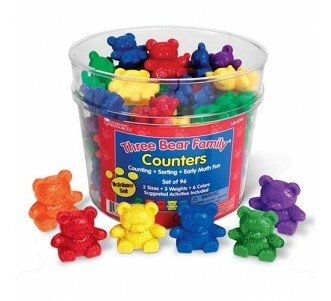 Botley encourages logic and critical thinking, and promotes problem-solving skills. This activity set is also very popular among parents as a holiday season present, as Botley is one of 2018's hottest STEM toys! 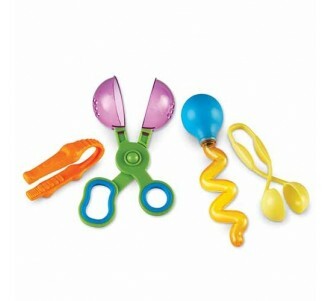 Amberbrook Learning offers two versions of Botley- the introductory 45-piece set (available online here) has everything you need to get started, while the 77-piece set includes additional accesories (available online here) for more complex programming tasks. 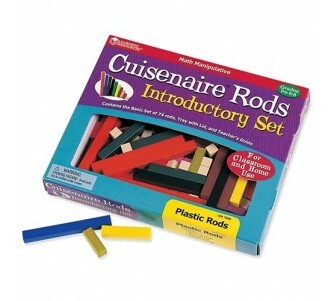 Either of these sets are ideal for home use and make great gifts. For schools, we are also able to source directly different bundles that are suitable for larger classroom use- just get in touch with us and we'd be happy to answer any questions you have about Botley! Colby is a programmable robot mouse from Learning Resources which is suited for younger children. Your goal is to help Colby navigate the maze to reach the tasty cheese! Colby can be paired with his best friend Jack (sold separately) for multiple player match ups! Children as young as 4 can learn how to program Colby (and Jack!) by following the included set of coding cards. They can build a maze and program the correct sequence of steps for Colby. Colby lights up, makes sounds, and features 2 speeds along with colourful buttons so is very appealing to younger children. This activity helps children learn the basics of coding and logic, and encourages them to think about optimal programming to find the most efficient path for Colby! 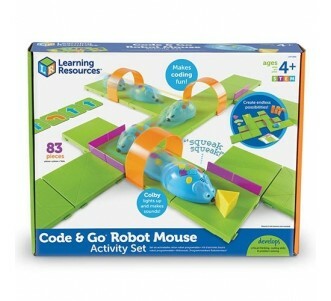 The Code & Go Robot Mouse Activity Set includes Colby (the blue mouse), 30 double-sided coding cards, 10 double-sided activity cards, a delicious wedge of cheese that makes a sound when Colby reaches it, and a detailed activity guide. You can buy the Colby activity set online here. Create a maze for Colby to navigate with the included 16 green square maze grids, 12 purple maze walls, and 3 orange tunnels and help him find that cheese! While you can of course use Colby for activities that don't require a maze (Colby is free to venture off and explore! ), children will develop spatial awareness and improve their logical thinking by guiding Colby through the maze and it's a good place for the younger ones to start. Experiment with more challenging mazes as you go along and race with Jack to see who can get to the cheese first! Colby's friend Jack is sold separately- you can find Jack (the purple robot mouse) for purchase online here. Botley or Colby? What's the Difference? Understanding a couple of key differences between Botley The Coding Robot and Colby the Code & Go Robot Mouse may help you decide which robot is more appropriate for your needs. In a nutshell, Botley offers a larger range of programming functionalities which may make it more suited for older children or for progressing to more complex and difficult challenges, whereas children as young as 4 can get started with Colby. Botley has added features such as object detection and the ability to perform programming loops. With object detection, Botley uses its sensors and is able to identify and go around any obstacles that are placed in its path, whereas Colby is only able to navigate along a clear path. You can use conditions to instruct Botley on what to do when it comes across an obstacle, so that Botley follows a different set of instructions! For example, you might program Botley to move forward 6 times- but once Botley detects an obstacle, you may want Botley to move back one step and turn right twice, before resuming the original instruction! The use of conditions is a key programming concept. Botley can also be given looping commands. A loop lets you repeat a set of instructions so that a series of multiple repetitive steps can be reduced to a smaller number of steps, thereby resulting in more concise and coherent code. Can you think about the series of steps you'd have to instruct Botley to turn a full circle? Understanding loops is a key programming concept. Colby (and his friend Jack) has colourful direction and speed buttons on his body. To program Colby, you simply press the different buttons in the specific sequence you want, and then you can start Colby moving by pressing the green "Go!" button. By following the included coding cards initially, young children will be able to visualise the programming sequence they're trying to code and get started quickly. On the other hand, you program Botley by using a separate remote control and your code is sent by infrared transmitter to your robot. Botley's remote programmer can store up to as many as 80 coding steps, so it's a good choice for older children or for progressing to more difficult and complex programming sequences. Younger children or those who are more comfortable with tactile learning may prefer pressing the code sequence into Colby directly by using the colourful buttons. It may be useful also to consider that, while both Botley and Colby can be used without the included obstacle course and maze accessories, there are different benefits and learning experiences that come from instructing Botley to make it through a challenging obstacle course using loops and conditions, and from instructing Colby to navigate a maze. We've found that many teachers like using both activity sets in their classrooms (for example, starting with the simpler and easier-to-use Colby for younger children and progressing to Botley). Please feel free to get in touch with us if you have questions or would like more advice on these brilliant STEM coding toys!